Another quarter flies by, and the new radio listening figures are published. The first thing to say is the overall listening is up. More people than ever before are listening to the radio every week – 91.7% of the population spending 1.076 billion hours tuned into the radio. One number that always attracts attention is the digital listening figure. Well that’s gone up, with 26.9% of all radio listening being via a digital platform (DAB, digital television or the internet) – that’s up 14.3% over the last twelve months (% on %). Furthermore, 42.5% of the population listen at least once a week via a digital platform and 40% of the population now own a DAB radio. One oddity in the figures is the apparent fall in internet listening during the first quarter from 3.6% of listening to 3.2%. This comes in the quarter that RadioPlayer was very successfully launched. I’d suggest that last quarter’s 3.6% was more of a blip than anything. The long term share is certainly heading in an upwards trajectory. In overall terms, the BBC has slipped a little in terms of listening, while commercial radio has grown. The percentage is still healthily in the BBC’s favour nationally, with 54.0% of listening to a BBC service and 43.7% to commercial service (the remainder is to non-RAJAR measured services and that could include non-UK radio). In London, it’s all a lot tighter, and where traditionally commercial radio has reigned, the BBC has closed the gap considerably this quarter. Listening is now 49.3% commercial radio to 48.5% BBC radio. As for the actual services, BBC Radios 1, 2 and 3 have all seen small declines in reach and hours (the two key measures). Radio 4 is largely flat in reach, but has seen a 2% growth in listening hours. Five Live is down a little in reach but up a decent amount in hours at over 50m following a fall last quarter. Perhaps it’s not surprising that TalkSport has its guns pointed at the BBC service (I’m not going to get into the rights and wrongs of that case here, except to say that while Five Live has undoubtedly strayed – notable when it started to use the word “entertainment” alongside news and sport – it’s not as bad as TalkSport would have you believe). Classic FM has seen a decrease in reach and hours this quarter, while TalkSport, in perhaps a lean sports quarter, has also seen a small decline in reach and a more substantial decline in hours. To say that there have been happy faces at One Golden Square today would be something of an understatement. My employer, Absolute Radio, has seen increases in nearly every measure. Absolute Radio saw its highest listening hours since launch with a 37% increase on the previous quarter. Reach is also up – 18%. 80s, 90s and 00s all continue to grow very strongly. Absolute 80s in particular saw an enormous 43% increase in reach 54% increase in hours. With 5.4m hours, it has more listening hours than strong digital stations like The Hits and Smash Hits, and it’s fast catching up with Planet Rock which has 5.8m hours (I suspect that the audiences are quite different though). Overall the Absolute Radio Network of services was up 38% to over 24m hours – a ten year high for the group’s history including previous Virgin Radio Network performances. And at breakfast Christian O’Connell has had his highest ever listening figures at this or any other station. The aforementioned Planet Rock did well with strong reach and hours increases, while Jazz FM has also benefited from its national DAB coverage (it went onto the platform just ahead of the start of Q2). It’s reach has jumped by 20% and hours by 8%. NME Radio has also seen strong increases, while Smooth has seen its national footprint gain healthy increases in spite of a disappointing performance in London. The big story nationally probably has to be BBC Radio 4 Extra. Previously known as BBC 7, it was finally rebranded at the start of the quarter, and it’s had notably more cross-promotion from the “mothership”. That’s resulted in a massive increase in listening. It’s up 39% in reach and 29% in hours. In one fell swoop it has become the largest digital only service in the UK, overtaking services like 6Music (which saw a small fall), The Hits and Smash Hits. Considering that there were only very modest changes to the actual scheduling of the service, with a few same-week repeats, spin-offs, and extended versions of Radio 4 stalwarts, it goes to prove the power of branding and marketing. As ever, I’ll also concentrate on London because that’s where I live and work. And as ever, nothing ever stays the same in the capital. Last quarter, you’ll recall, Capital London was comfortably number one in reach and hours. Capital has seen some significant falls in both reach and especially hours (down 19%). At the same time, Magic has jumped back with a 14% increase in reach and a 19% increase in hours. It’s now the biggest commercial station in the capital by both measures. Heart saw a fall in reach, but a decent increase in hours, and it’s now number two in the latter, and number three in the former amongst commercial stations. LBC in London had a poor set of results when measured in hours falling by 31%. Xfm, ahead of their new Danny Wallace breakfast show which won’t kick in until next quarter, saw decent rises in reach and hours. Kiss was fairly steady (up in reach, down in hours) and Choice had a good set of numbers with double-digit increases in both reach and hours. At breakfast, Chris Moyles has lost a handful of listeners (well a Wembley Stadium sized handful – 80,000). Chris Evans has been a little more careless, losing over half a million listeners putting him back to where he was a year ago. Classic has seen a slight fall at breakfast, while TalkSport has seen an increase (I’ve already mentioned Christian O’Connell at Absolute Radio). In London, Johnny and Lisa slipped a bit, as did Jamie and Harriet. Neil Fox mirrored his station in increasing his breakfast figures, while Rickie, Melvin and Charlie also put on listeners. Finally, I’ve updated that big RAJAR history chart I did before. As I previously mentioned, your best bet is to view the fullscreen version. To learn more about what I’ve done here, as well as the shortcomings of the data, read what I wrote a couple of months ago when I first published this chart. That’s about your lot. Drop a note if you want to know more or spot any errors! The RAJAR website has plenty more, including a summary of all stations’ results. Matt Deegan’s blog, where he has an excellent piece looking at trends rather than one-off results. Paul Easton’s blog, where he looks in detail at the London market. James Cridland’s blog, where he examines the impact of brands. Nik Goodman’s blog, where he tells you how to write, and how not to write, a RAJAR press release. 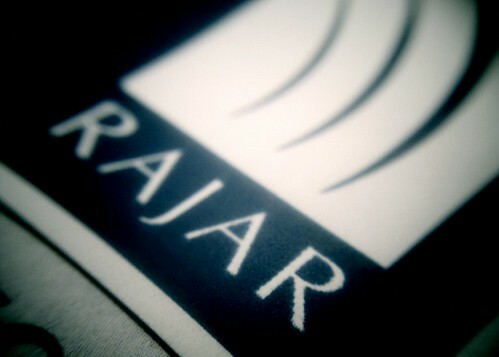 Source: RAJAR/Ipsos-MORI/RSMB, period ending June 2011, adults 15+. What exactly is the problem, and how serious is it? I’ve no idea as I don’t work for the BBC. I’d suggest that it might be a measurement issue rather than anything more severe, but I don’t know for sure. It’s worth clarifying that the stats the BBC and others publish about their online listening are entirely different and separate from quarterly RAJAR results. Those iPlayer results are derived from server logs of streams the BBC knows it served, whereas RAJAR results are compiled from a sample of the UK population who are asked to record what radio they listened to, when, where and on what platform. As such, they’re just not comparable. In any case, as I mentioned above, I don’t believe that there’s any RadioPlayer issues that have caused this quarter’s numbers to fall. I think that it’s fairer and more accurate to look at the longer term trend which shows an overall increase in IP listening. Yes, I appreciate that iPlayer and RAJAR results are not comparable for the reasons you give, but I was struck by a headline “Online listening down 5 million since Radioplayer launch” (from http://www.broadcastnow.co.uk/news/radio/online-listening-down-5-million-since-radioplayer-launch/5030508.article) and I wondered whether that headline was drawing an incorrect conclusion owing to the suspect RadioPlayer figures? No. They’re just looking at the raw RAJAR reported internet listening numbers. And they do indeed show a fall of 4.3m hours (not 5m as cited in the Broadcast headline) between Q1 and Q2 2011. On the other hand, the current figure of 34.3m hours is comfortably the second largest number of internet listening hours recorded since they started being measured in 2007. As I say, it’s the overall trend that’s your best bet for examining a true reflection of any listening measure. And ss even the Broadcast magazine article (which is behind a paywall, so sadly I have no access to) says, internet hours are well up on last year. As I say, I think it’s more a question that Q1 was something a statistical anomaly than anything more dramatic. It’s also worth noting that with all those bank holidays surrounding the Royal Wedding, we had more holidays than usual in this quarter. Internet listening is a disproportionately carried out “at work”, and there was less work being done during Q2. I’ve no knowledge of any service reliability issues with the BBC’s RadioPlayer offerings. There certainly weren’t any for us. I suspect that the “suspect RadioPlayer figures” you’ve referred to, are just to do with their measurement systems failing to measure all of the BBC’s listening during the transition to using RadioPlayer technology, and not to do with service quality.